This may just be the beginning of a long and fruitful friendship! Facebook is a well-known social platform. Or as they put it: “ (Facebook) is a social utility that connects you with the people around you. ” I’ve been playing with FB last few years, not that early adopter world wide but quite early here in Finland (as it has gained popularity during past year). Anyway, Facebook’s business model is quite interesting, altogether. Ads, targeted marketing, applications etc! (If you’re interested: Facebook Case Study: Offline behavior drives online usage, Facebook’s uncertain Business Model, Facebook Platform Developers’ Guide (with business model warnings) and so on). Business model is a whole different matter – perhaps I’ll post something about that later. This posting will focus on Facebook’s (targeted small) ads. FB promises “advanced targeting“, where ads can be targeted by “age, gender, location, interests and more”. As a Finn living in Finland this is quite interesting as Finland is a small country with a low populage, only 5,1 million or so. Language spoken is finnish – not that common elsewhere;) Now, why is it interesting? First things first, finns in Facebook are quite neat a target group. The Finland Network at Facebook has at the moment (25th June) about 410 000 members. Supposing these are mainly Finns we can say that 10 % of Finns is moderatly active at FB. Now, if you want to target all Finns you can pick that group as target or all the members who give their location as Finland (this probably would include all the foreigners in Finland, too, excluding Finns abroad). Picture of a young (skinny) lady in a smallish swimsuit on a beach. Some kind of weight loss dingy. Not relevant at all. I don’t a) need to lose weight b) want to lose weight. Translated from some other language. Picture of cups with Moomins. Web address with a promise of quick shipping. Well, I have two of those cups, so quite relevant. Picture of some guy with huge glasses wearing a lot of bling. Some half-naked ladies behind him. 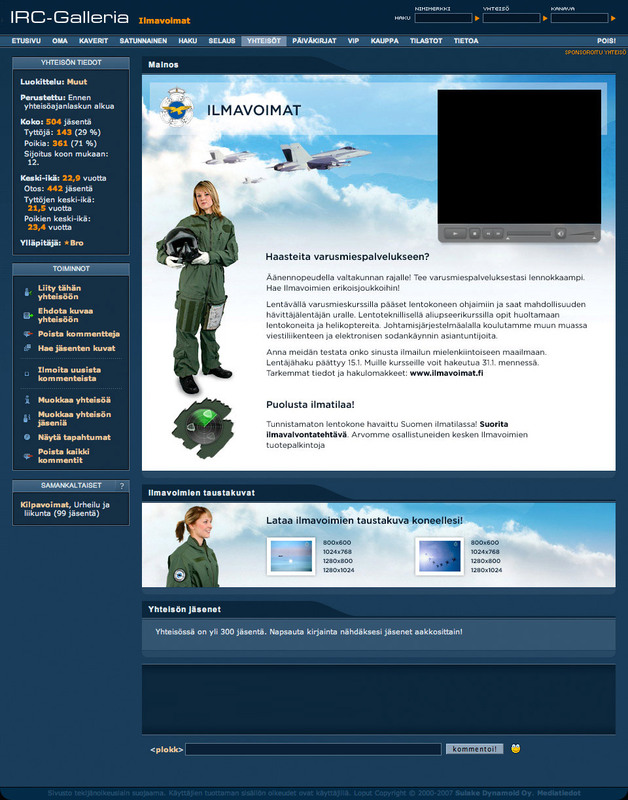 Text tells me to pimp my life (“tuunaa elämäsi”) and a web address. Not relevant at all. I don’t want to pimp my life. Picture of a MacBook Air. Ad for some online auction. No pictures. Some generic ad fro health products online. Not relevant. Side note: selling pharmacy related stuff online is illegal in Finland. This ad is actually for natural remedies. Logo of a web site. Text tells us about this wonderful service which you can use online or with a Handy. 1 year MBA in Boston. Picture is obscure – don’t actually know what the hell is in it. Golf clubs? Ad for some MBA in Boston. Not relevant. I think my M.Sc (tech) is enough. Logo of the company. Text says that they’ll help me to get a loan online. Hmm. Hard to say, perhaps relevant. Says my cousin added this one particular Facebook application. Logo of the application. says the above plus that I can use this application for what it was meant. Hmm. I actually do have this application installed. Don’t like it (nor use it), though. Well, not that many hilarious results this time. Conclusions? Those ads weren’t very relevant for me. Online auctions are not my thing, nor is weight loss or diets. I have plenty of applications installed (too many! ), but I don’t add them usually from an ad. At my case the targeting was quite bad. Some other time perhaps better!